In 2011, the first year CPS Energy partnered with San Antonio Youth Literacy on its Reading Buddy program, which pairs volunteers with second graders a half an hour a week to help them learn to read, 16 employees signed up. This year, we’re proud to say that 104 employees are participating, making CPS Energy SAYL’s largest Reading Buddy partner. And yet, SAYL desperately needs more volunteers. Roughly 75 percent of second graders in San Antonio schools being served by SAYL read below grade level, said Christina Martinez, executive director of San Antonio Youth Literacy. San Antonio has the second highest illiteracy rate among major Texas cities. San Antonio ranks 7th in U.S. population, 62nd in literacy. The State of Texas forecasts the number of future prison cells to be built based on the number of children NOT at reading grade level at the start of third grade. Those are sobering stats. But here’s one that explains why CPS Energy is such a big fan of the Reading Buddy program, and why we’d like to challenge our fellow San Antonio companies and their employees to become Reading Buddy partners today: just 30 minutes of reading with their Reading Buddies each week boosted second graders’ reading skills by more than a grade level! Some kids saw an even bigger improvement. CPS Energy employee Walter Menck volunteered last year at Arnold Elementary School. Yup, just a half an hour a week. 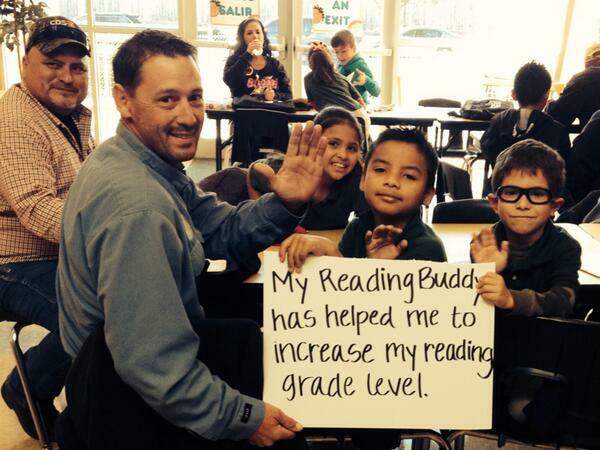 Even so, you might think you don’t have time to volunteer for the Reading Buddy program. Our employees have come up with a couple of innovative ways to fit the time into their work week, including partnering with a co-worker to alternate weeks. That worked for Carla Raley, ED & CS manager of asset management & reporting. We also use alternates. If a Reading Buddy is unable to attend a session, they let us know in advance so that another Reading Buddy can take his or her place, said Ann L. Martinez, NWSD administrative assistant II. Last year, CPS Energy field personnel averaged 25 tutoring sessions during the school year, far surpassing the average of 8 sessions. We’ve found ways to volunteer for the SAYL Reading Buddy Program — now we challenge you to make a difference in a child’s life by spending 30 minutes a week as a Reading Buddy.